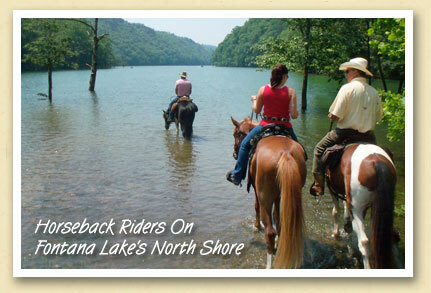 While their horses enjoy the cool water, these riders drink in the beauty of Fontana Lake and the surrounding Smoky Mountains. The Great Smoky Mountains National Park has more than 800 miles of trails, and most are open to horseback riding. Water features — streams, cascades, waterfalls — are plentiful, including the massive Fontana Lake with its more than 240 miles of shoreline. You’ll find more information about trails, Fontana Lake and horseback riding in the Smokies at the Bryson City area online travel guide.